In stores nationally by end of year. 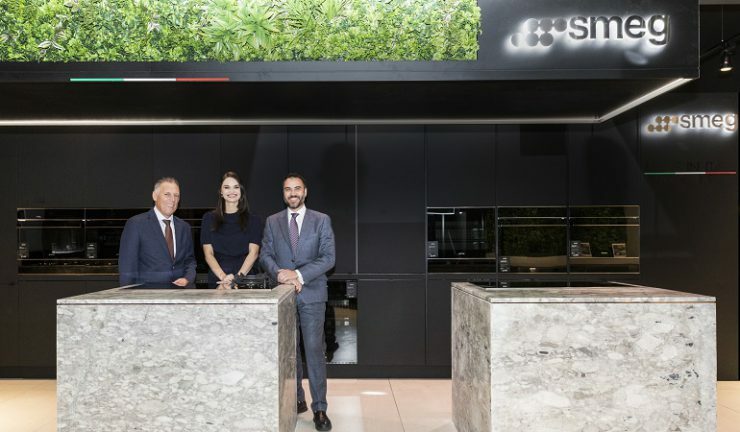 Smeg has unveiled the first of its Dolce Stil Novo displays at Winning Appliances Redfern, NSW. Additional displays will be rolled out nationally throughout the remainder of 2018. Bespoke joinery, lighting and flooring are paired with a premium mix of finishes that includes Nanotech Fenix cabinetry in super matte plus Aurora marble from one of Australia’s premier quarries. Designed by leading kitchen design firm, Minosa, the concept for the displays is a perfect fit with the premium Dolce Stil Novo collection designed by Italian architect, Guido Canali. The Dolce Stil Novo collection – Smeg’s finest and most advanced collection to date, which was on display at this year’s EuroCucina, includes steam assisted pyrolytic ovens, combi-steam ovens, speed ovens, gas blade flame on black glass cooktops, gas on glass cooktops, induction cooktops, wine cellars, blast chillers, as well as a vacuum drawer and coffee machine. There are also storage drawers with the ability to have inserted accessories such as chef’s compartments, sommelier drawers and spice drawers, sold as accessories.